Perhaps you’ve noticed that gold was under attack before the $165 price drop 9/22, 9/23. So what, isn’t gold always under attack by the Establishemnt? What’s particularly interesting is that the most recent attack occurred precisely as the the Swiss National Bank announced the peg of the franc to the euro. What should normally be immensely bullish news for gold, is being held in check. Even the illustrious Paul Krugman has joined the fray with his latest blog piece for The New York Times: Treasuries, TIPS, and Gold (Wonkish). “I have no idea what drives the price of gold,” but then it’s quickly back to the business at hand. Slogans about debased currencies? Could it not be the debased currencies themselves? Now that the Swiss National Bank has committed the franc to the wrecking yard of paper monies, isn’t it just a question of simple math and counter party risk? If every central bank in the world states that their policy is to continually reduce the purchasing power of their currencies, then why wouldn’t a rational person choose to store their wealth in gold? The real problem here for Mr. Krugman is that the situation is becoming increasingly clear to too many people. Gold is a way for the average person to opt out of the global ponzi scheme of fiat money and unsustainable debt. “OK, how do we think about gold prices? Well, my starting point is the old but very fine analysis by Henderson and Salant, which was actually the inspiration for my first good paper on currency crises. H-S suggested that we start by modeling gold as an exhaustible resource subject to Hotelling pricing. “Here’s how it works. Imagine that there’s a fixed stock of gold available right now, and that over time this stock gradually disappears into real-world uses like dentistry. (Yes, gold gets mined, and there’s a more or less perpetual demand for gold that just sits there; never mind for now). 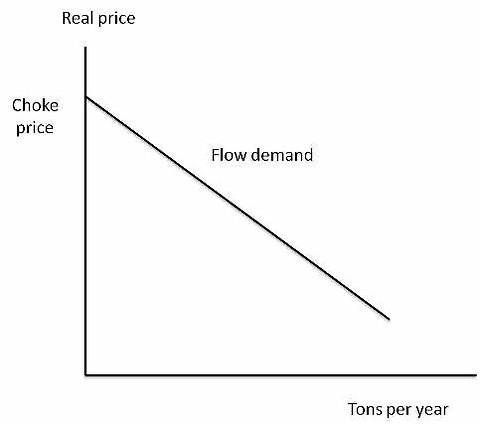 The rate at which gold disappears into teeth — the flow demand for gold, in tons per year — depends on its real price: graph. “Crucially, at least for tractability, there is a ‘choke price’ — a price at which flow demand goes to zero. As we’ll see next, this price helps tie down the price path. “So what determines the price of gold at any given point in time? Hotelling models say that people are willing to hold onto an exhaustible resources because they are rewarded with a rising price. 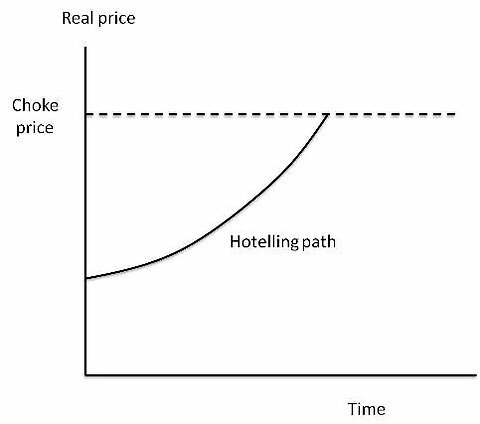 Abstracting from storage costs, this says that the real price must rise at a rate equal to the real rate of interest, so you get a price path that looks like this: graph. Now that’s more like it! This is how a Nobel Prize winning economist goes about attacking the truth. He employs a highly sophisticated form of econo-babble designed to leave any potential dissenters in a catatonic state. A single PhD trained economist can easily defeat an entire population through this powerful form of mind control. Throw out a few choice phrases like flow demand and choke price and within seconds eyes begin to glaze over and minds start to wander. Soon enough, the great unwashed masses are just begging for the “experts” to decide their economic fates for them. And, so Mr. Krugman dutifully earns yet another paycheck. His work as chief propagandist for the central banking system is done here. If you’ve made it this far, be sure to check out one of the most important articles you’ve never read: Priceless: How the Federal Reserve Bought the Economics Profession.